Anyway, as usually happens when I finally jump into a project that I've been postponing, once I got into it I immediately started having fun. Didn't get nearly as much done today as I wanted to, but at least I made a good start. The project is a mini mural, acrylic on wood. It's a custom built cover for an electrical box and my daughter, Hollie, (actually, she's my step-daughter but I prefer to leave off the "step" and claim her fully) requested a design on it that matched the wallpaper border that she'd chosen. It will hang in her laundry room, and the wallpaper border pattern is country style art with old fashioned things like a washboard, cakes of soap, bunches of lavendar, pitchers and the like. 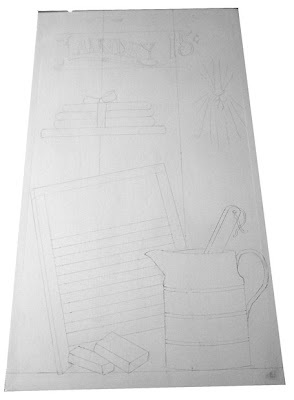 Since the border pattern is only about 10 inches high and the cover is 19.75" x 35.75" and vertically oriented, I selected some of the objects and drew them in what I hope is a pleasing design. I sealed the bare wood with a couple of coats of Kilz and drew the image using a beige watercolor pencil. This worked great because the water based pencil erased easily if I needed to make any changes. So that's where I am at the moment. Today was "think day" in which I worked out design and got the drawing done. Next session will be painting. Yum.... my favorite part..... color! I'm posting a WIP of today's work. It's not a good image, but the beige pencil on the white background did not show up well at all. To make it easier to see I converted the image to black and white in Photoshop, and tweaked it using Levels and Unsharp Mask. Because it's too large and heavy for my drawing desk I'm working on the kitchen table... which means no blueberry pancakes for breakfast in the morning. Sigh.... the sacrifices one makes for art! On another note, not too long ago I met Laure Ferlita through her blog and found some really beautiful artwork..... and a fun, generous art friend. She's been quick to offer encouragement and share her expertise. Because her blog (built into her web site) offered very little in the way of bells and whistles she has just made the transition to Blogger. If you'd like to pop over and see what she's up to I'm sure she'd welcome the company. Her new blog is here. 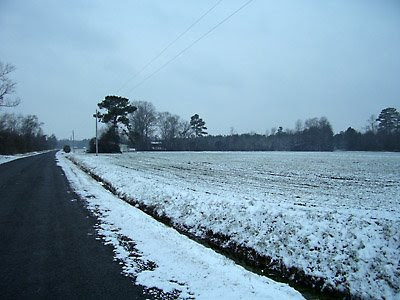 Oh, one last thing......... the snowy pic above is the road I live on. 4-8" of snow was forecast for this past Tuesday, but I was SO disappointed that we didn't even get enough to cover the ground :-( If you look down the road you can see two buildings. The second one - the one farther back in the woods - is an old fashioned two story tobacco barn...... the kind that's becoming a rarity as more of them decay and collapse. Lots of stories and history in those old wooden tobacco barns. But that's another post for another day. Hollie's a lucky girl! Your composition looks great--the drawing itself is very nice; look forward to seeing it as it progresses. When I think of all the little fishing shacks along the backbays that have given way to prefabs over the years, I wish I had recorded their existence ... It's sad to think how much disappears unnoticed as life barrels on. Looks like you're off to a great start on your mini-mural can't wait to see the color! Thanks too, Teresa, for the kind words and mention of the new blog! I love your very atmospheric moon below. What is Colorfix? New project looking good! I know how it is to put off a piece you have been thinking of doing. Please take pictures of your old tobacco barn as you don't see many anymore and soon all of them will be gone! Teresa- Thanks for stopping in at Robot Nine. Love the WIP as you say, of the watering can. Very clean lines. I am a messy artist myself and always admire (and envy) the artist who works clean. Hmmm- pretty artist, laid back lifestyle, loves cooking! Marry me! Sorry you were disappointed by the lack of snow. If you get time today, please pop to my blog and tell me what luxury you want to take tothe Desert Island. All our books are listed and packed and we are setting sail today ! Oh what a great drawing, Teresa! IT's going to be glorious! Andthe snow -- it looks like my road too! Good luck with the painting! Thank you - each of you - for the kind comments and encouragement! And, always, thank you for visiting. Laura: You're right... life does "barrel" on and we lose much along the way don't we? Acornmoon: Left Colorfix explanation on your blog! Twin Cedar: I have taken some photos of our rural landmarks but probably not as many as I should. I try to take my camera with me when on the road in case I see something I want to capture. I'll check out your Cute Times TEn blog... and do visit again! Weaver: Possibility of snow again next week... maybe this time it will be plentiful!